The “endless” lazy river is15 feet wide and has a floatable length of over two football fields. Designed for families with small children in mind, the lazy river is two feet four inches deep and will have a large zero-depth entry zone. The attraction holds 185,309 gallons of water and has multiple spray features. Approximately 6,000 square feet of new beach area featuring “riverside” cabanas and chaise lounge chairs will provide convenient relaxation areas adjacent to Float Away Bay. Also new this year, guests are able to buy Idlewild & SoakZone FunDay Passes online at www.idlewild.com for only $29.99 - a $7 savings from the regular gate price. Senior FunDay Passes (age 60 and over) are $25.99 online, a discount of $2 from the senior gate admission. Children 2 years and under are FREE. Idlewild & SoakZone tickets have also gone mobile. “Buying tickets online just got easier with our new mobile access,” explains Leonatti. “Buy your daily tickets from your smart phone and we’ll scan your phone at the gate. No printing, no paper, it’s that easy!” Discounted FunDay Passes are also available for purchase at participating Giant Eagle locations for $28.99. The park offers new season pass options for 2013, allowing pass holders to choose the “perks” that best suit them, in three pricing levels starting at just $54.99. The Basic Season Pass offers unlimited admission to Idlewild & SoakZone during the summer season, Oktoberfest Weekends, and Hallowboo, along with discounts to sister parks - Kennywood, Sandcastle, and Dutch Wonderland. The Premium Season Pass additionally offers ten Bring-A-Buddy-Free dates and nine Bring-A-Buddy-for-$10 dates and qualifies the pass holder for weekly in-park discounts. Upgrading to a VIP Season Pass entitles pass holders early access to specific SoakZone attractions 30 minutes before the general public and additional in-park vouchers. Idlewild’s summer lineup of special events provide the best and most popular reason to purchase a season pass. The family-friendly events include Mister Rogers’ Neighbor Days, Antique & Classic Car Days, A Story Book Forest Christmas in July, Princesses in the Park, and Marvel Superhero Week. Lots of entertainment will be offered throughout the park, headlined by the return of THOMAS & FRIENDS® FULL STEAM AHEAD LIVE, which is performed three times daily in Raccoon Lagoon. Hillside Theater shows include PREMIERE – MUSIC OF THE SILVER SCREEN – celebrating the best music from Hollywood feature films, and CAMP ROCK TALENT SHOW – an entertaining and humorous romp set at a summer camp. Country Music fans will enjoy NASHVILLE FOREVER, presenting the hottest, iconic country songs of all time at the Hootin’ Holler Gazebo stage. Nearby will be STANDOFF AT HOOTIN’ HOLLER, an all-new, action-packed stunt show located at the former Dizzy Lizzy’s ride. Also daily at various locations around the park, children can meet and greet their favorite Idlewild & SoakZone characters - Ricky Raccoon, Duke the Dragon, and Sir Topham Hatt. Editors note. A 'Float Away Bay – Media Day' will be held at the Park on Friday, June 7th at 11AM. For more details on Idlewild & SoakZone’s attractions, events, and operating schedule, visit www.idlewild.com. ABOUT IDLEWILD & SOAKZONE - Idlewild features seven, fun themed areas including SoakZone Waterpark, Story Book Forest, Mister Rogers’ Neighborhood of Make-Believe and more. It has been named “Best Park for Children” by Amusement Today magazine and “Best Park for Families” by the National Amusement Park Historical Association. Seasonal operations run from May 23 through September 15 and “Hallowboo,” a Halloween-themed event, takes place in October. 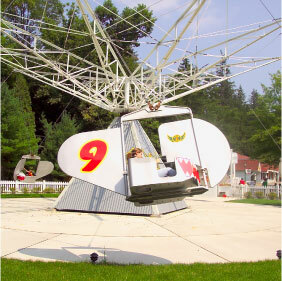 ABOUT PALACE ENTERTAINMENT - Idlewild is part of the Palace Entertainment family of parks. Palace Entertainment owns and operates theme parks, water parks and family entertainment centers nationwide, including Kennywood, Sandcastle, and Dutch Wonderland on the east coast and Raging Waters on the west coast. The company entertains millions of guests annually and is one of the largest park operators in the United States. For more information, visit www.palaceentertainment.com.